By Michael Barson. Forth Worth: Texas Christian University Press, November 2008. Paper: ISBN 978-0-87595-379-2, $29.95. 178 pages. 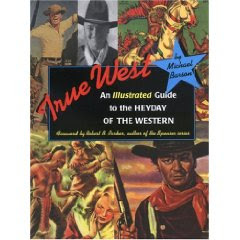 This is a true aficionado’s book—the product of an author who grew up in New England but developed a liking for the West as represented on television and in the movie theatre. Barson recalls how he experienced firsthand the craze for Davy Crockett that swept America during the mid-1950s; like millions of other American kids, he bought one of Crockett’s coonskin caps. Other role models included Rowdy Yates (Rawhide), Sugarfoot, and Mark McCain (The Riflemen). As he grew up, Barson realized that while the West as portrayed on television might differ significantly from the “real” West--Texas, Colorado, California—it provided a means for him to reflect on “the sources of our native pluck and resilience. They [television Westerns] were part of the […] process by which Americans define—and revise, and define again—a national self-image” (21). True West tells the story of the West as represented in films, television series, pulp fiction, music, comic books, and other souvenirs. It begins in the 1920s, when stars such as William S. Hart and Tom Mix produced a steady stream of silent films for admiring audiences; by 1929 Mix had made nearly 330 films. In the era of the talkies A-list stars such as John Wayne made classics like Stagecoach, while William Boyd, Gene Autry, and Roy Rogers turned out a steady stream of B pictures. Barson demonstrates just how powerful a hold these stars exerted on the American public, with their images being reproduced on sheet music, paperback books, posters, and other goods. I especially liked the advertisement produced under Boyd’s name offering his young fans the chance to “win a Hoppy [Hopalong Cassidy] bike, or cowboy outfit, or shootin’ irons, absolutely free” (22). In the early 1950s the vogue for B-pictures subsided with the growth of television. Both Autry and Rogers responded by creating their own series: The Gene Autry Show debuted on CBS in July 1950, with The Roy Rogers Show following a year later. Both ran until the middle of the decade, when the aging stars hung up their spurs and lived on their royalties. Barson offers a personal choice of one hundred favorite Western films ranging from Stagecoach (1939) to comedies such as The Paleface (1940) and Oklahoma! (1955), but excludes modern Westerns such as Blazing Saddles (1974) and more recently The Assassination of Jesse James (2007). The author concentrates instead on the television series that dominated the screens during the 1950s and 1960s—Wyatt Earp, Gunsmoke, Rawhide, and Bonanza. He argues quite rightly that the genre lost its popularity during the 80s, but expresses the hope that contemporary miniseries such as Comanche Moon (2007) might signal a revival of interest: “[I]t [is] possible to capture the epic scope of the best Western films even on television, given a good script, top-shelf acting, and quality directing” (109). The book’s concluding chapters cover classics of Western literature, music, and comic books. Featured authors range from pulp-fiction specialists such as Elmer Kelton and James Warren Bellah, to modern authors such as Cormac McCarthy. The songsters include Bing Crosby, Frankie Laine, and Johnny Cash. Barson’s fondness for Western themes is obvious; he even provides the lyrics to the theme from Rawhide, described as “three minutes of two-fisted gumption” (134). The song has affected legions of filmmakers; it provides the basis for one of the most memorable sequences in The Blues Brothers (1980), where the eponymous heroes perform it (repeatedly) in front of an audience of rowdy hillbillies. True West might not be a very scholarly work, but it provides an entertaining read. The beautifully reproduced color plates give an idea of the sheer range of artistic talent than went into producing posters, comic books, and other ephemera. If nothing else, this should render the book appealing to anyone interested in Westerns and their influence over twentieth-century American popular culture.